The A0 Diamond Student Kit is designed for students and researchers who want to get familiar with CVD diamond detectors. It enables you to study the electronic properties of these innovative detectors and discover their response to various radiation fields. The A0 Diamond Student Kit contains a full laboratory setup with diamond detectors, related electronics and all cables and connectors needed for immediate operation. Laboratory sources such as α-, β- and γ-sources are needed for the experiments with the Diamond Student Kit. The ideal start package for exploring this novel technology for particle detection. includes a graphical users interface (GUI) with oscilloscope mode and real-time data analysis applications. optionally including a power supply for detectors and amplifiers. 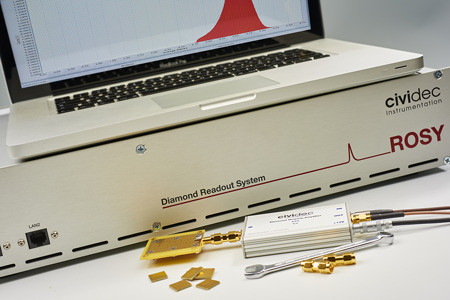 The A0 Diamond Student Kit can be completed with the ROSY® Readout System. Dedicated real-time applications allow to record particle spectra and study real-time particle identification. * ±500 V @ ±1 mA for detector bias voltage. * +12 V @ 400 mA for our AC-coupled amplifiers. * ±15 V @ ±150 mA for our DC-coupled amplifiers.